Libraries across Cheshire West and Chester will be celebrating National Bookstart Week from 4 June, with range of exciting events to encourage families to have fun reading together, anywhere and anytime. 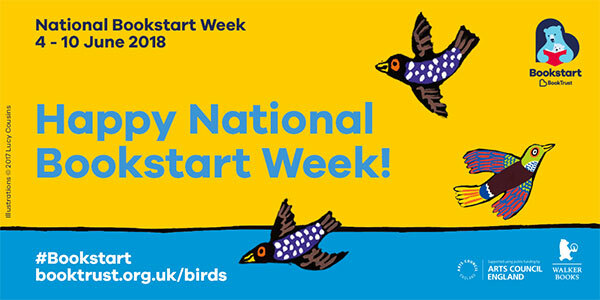 National Bookstart Week is an annual celebration of the charity BookTrust’s flagship reading programme, Bookstart. Families should visit their nearest library or children’s centre to find out more about their local National Bookstart Week event. If families are unable to make it along to their local event they can join in the fun at home, with plenty of arts and crafts and games, all on the Bookstart website. Join Bookstart Bear at the community garden for rhymes and stories, join in with the' Bird Boogie'. Bookstart Bear event. Visit from several preschools, meet Bookstart Bear, with rhymetime and crafts. Celebrate National Bookstart Week with stories, rhymes, games and crafts. Fun in the park with Ellesmere Port Library and Stanlaw Abbey Children’s Centre. Stories, rhymes and a Bird Boogie in the park (if raining in Winsford library) Enjoy the newly designed park with stories, rhymes and a bird hunt. Bookstart party in the park (if raining in Lache Library) Plus activities and rhymes with Children's centres. In a first for Cheshire West and Chester libraries, there will also be “toy sleepovers” at several branches. Children are invited to bring in a teddy bear or other cuddly toy. The toy will then stay overnight at the library. The staff will stage photographs of the toy reading with other toys and getting up to various activities. When the children come to collect the toy, they’ll be presented with photos of what toy got up to during the stay, a certificate and a recommendation of a book that the toy enjoyed reading during their stay. Sleepovers are at Barnton, Frodsham, Great Boughton, Neston, Sandiway, Wharton and Winsford. Ask at the relevant branch for more details. Wednesday 6 June. BookStart storytime, Great Boughton Library, 2.30 to 3pm. Stories and songs with a bird theme. Thursday 7 June. BookStart Rhymetime, 2.30 to 3pm, Barnton Library. Movement and rhymes for your busy bird. Thursday 7 June: 10.30am to 11am, 11.30am to 12 noon. “Bookstart Baby Birds Boogie” –songs with a bird theme followed by a parent and baby friendly craft to take home.